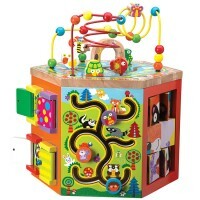 Jungle Fun walking activity cart includes 8 various manipulative stations for your toting toddler or beginning walker. Oh, yes, it's the whole jungle of motor activities for your toddler! 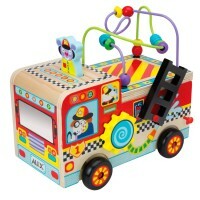 Jungle Fun Multi Activity Cart Push Toy by Alex Toys means pushing, and walking, and moving, and sliding, and flipping, and music playing, and rolling, and twisting and more! 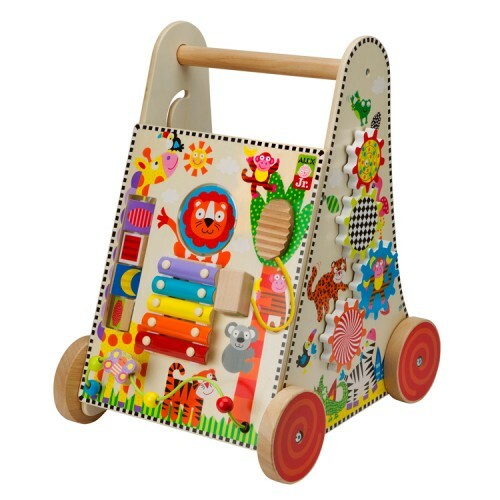 Awesome toys for beginner walkers, this push toy cart is made of quality woode with 8 fun activities for the little hands. 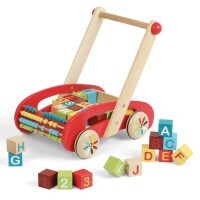 This wooden play center on wheels features smooth handle bar, 4 bright red wooden wheels and 3 sides of manipulative fun. 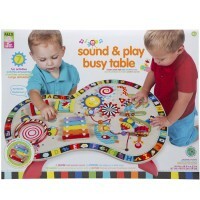 Your baby or toddler will love to spin the colorful gears, slide the jungle animals down the path maze, flip the turning tiles with shapes and patterns, play notes with wooden mallet on the lion's xylophone or make noise on the wooden washboard, move beads along the curvy wire maze, or check themselves in a baby safe mirror. You toddler will love to store their favorite stuffed animal or other toys inside this cart and transport them around during their stroll in a park, or inside the house. Colorful artwork, friendly jungle animals, bright colors, attractive design, and multiple play features make this activity cart one of Educational Toys Planet's best toddler toys. Adult assembly required. The push cart comes with hex key. Parents will need their own Phillips screwdriver to set up for their tots the manipulative center on wheels. 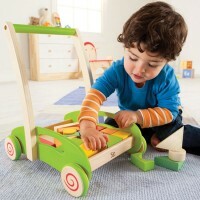 Jungle Fun Multi Activity Cart Push Toy measures 12. 75 x 15.5 x 19 inches assembled. 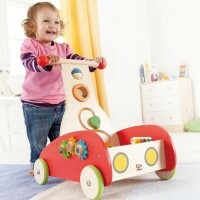 Push this walking activity cart around your house and have developmental fun for hours! 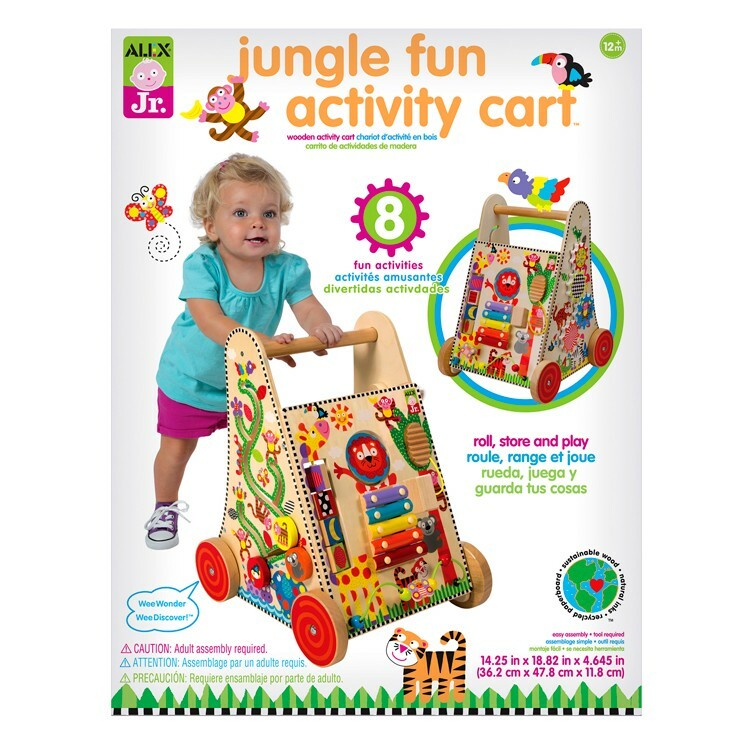 Dimensions of package 4.75" x 18.75" x 14.5"
Write your own review of Jungle Fun Multi Activity Cart Push Toy.